Introducing Firefox’s very own chat client complete with video chat functionalities. Access this bad boy by clicking on the smiley face on the top-right corner. Google Hangouts users should get the hang of it in no time — no software download necessary. Technically, you don’t even have to be on Firefox to use Hello; just be sure you’re on WebRTC-supported browsers like Chrome or Opera. 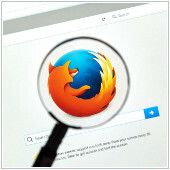 Catering to the more tech-savvy users, Firefox’s secret interface gives you a peek behind the curtain into the world of coding. This helps you make adjustments to improve browser performance. Don’t have too much fun, though — exercise caution at all times! Choose which items you want to see, and maybe even discover new ones you might have never known about! Decorate your control panel all you like! Click on the hamburger in the top-right corner and then click Customize at the bottom. Drag and drop desired items into the “Additional Tools and Features” window, and presto! Firefox’s Health Reports compiles data on user behavior and overall performance to provide you with comparisons and meaningful tips. Also, the aggregated data reveals various ways to improve your browsing experience. This personalized report consists of figures on browsing data, time spent browsing, crashes, as well as how long it takes to open a new tab (measured in milliseconds, of course). ‘One can never be too safe’ is the mentality you should have every time you log on. Enter the master password. This acts like a key that unlocks all your vital passwords and information that could be detrimental if left exposed. Create your own by going to the Menu button > Options > Security tab. Then check the box next to “Use a master password” and follow the directions in the pop-up window. If Mozilla’s current shortcuts take too long to master, consider your problem solved. With the help of the Customizable Shortcuts extension, you have the luxury to design your very own shortcut sequences. No more confusion, no more time wasted. To spare you the fuss of entering prefixes or suffixes, Firefox lets the new URL auto-complete feature do the work for you. For example, type in “wordpress” in the address bar followed by Ctrl + Enter (Mac: Command + Enter) and voila! Firefox fills in the www and the .com parts. Other variations include “Wordpress” followed by Control + Shift + Enter (Mac: Command + Shift + Enter) for .org sites. For any dot-net sites, you would type the URL followed by Shift + Enter. If you haven’t noticed the tiny paper plane icon in the top left corner, then say hello to the new Firefox share button. This enables you to share whatever you want to a multitude of social media accounts. Make sure you’re logged into the accounts you want to send to, and spread the word with a single click. Manage accounts by heading to the Add-ons manager > services. Improving browser usage is key to acquiring a competitive edge — a vital component to rising above the rest and achieving success. If you have any questions or are uncertain about any Firefox upgrades, feel free to give us a call. We are more than happy to help.